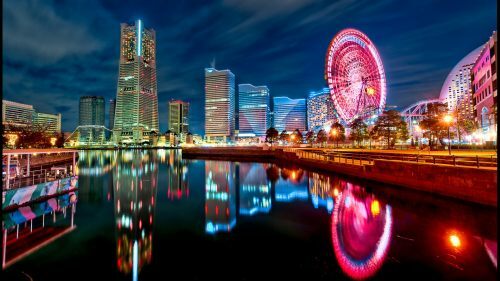 1 stop flights from Kelowna to Tokyo, Japan are available for just $745 CAD roundtrip including taxes. 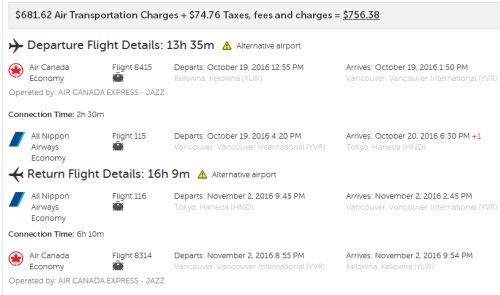 This is a new record for the cheapest flights from Kelowna to Japan, and 37% below the typical cheapest roundtrip price. The flights use a combination of Air Canada and All Nippon Airways (very good airline) via Vancouver. October, November, and up to mid December 2016. January, February, March and April 2017. - Click on the departure date box to open up the calendar view. Enter the same dates you found on Google Flights. You can also try starting with this direct search link and click on 'Edit Your Search' (top right) to try other dates. You may want to try clicking on '1 Stop' on the left hand side of ITravel2000 to filter the results. kelowna, YLW, flight deals, air canada, asia, east asia, japan, tokyo, nrt, all nippon airways, ana or hnd.